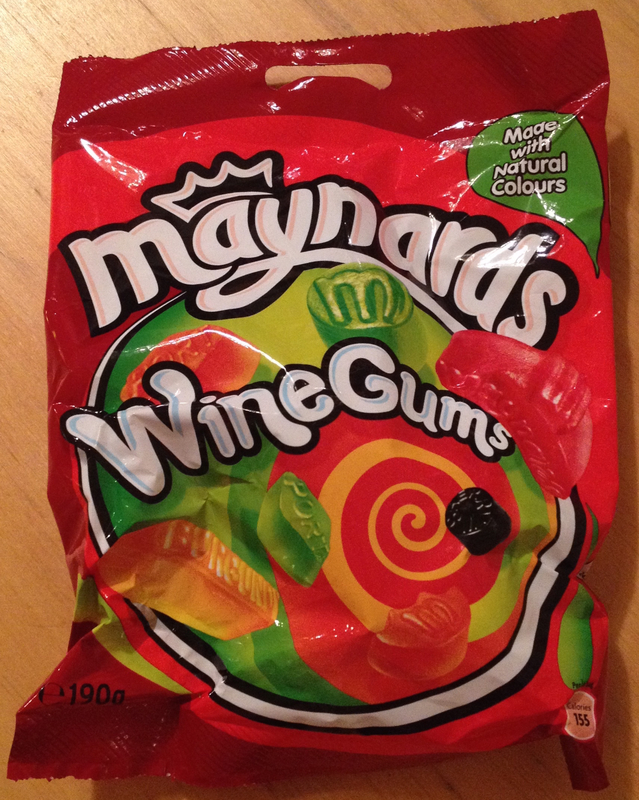 When I first moved to the United Kingdom nearly 20 years ago, I discovered the Maynards Wine Gums and being a Haribo convert and loving anything gummy, sweet and black currant flavored, I became an instant fan. And then the whole Mad Cow Disease broke and there was rumor/conjecture/fact that wine gums were made out of gelatin (made from those mad cow’s joints or muscle, bones or gristle, I’m not quite sure) and they fell out of favor with me. I stopped buying them (I was a vegetarian at the time and did think it would be tragic and also ironic if I got Mad Cow Disease, not from eating cheap burgers or sausages, but from these blissfully nearly blameless fruit candies), but that decision did come with anguish every time I spotted them in the grocery checkout aisle. Fast forward to this past year and I started thinking about those wine gums again. When my mother-in-law was packing her bag to visit us in November, I asked her if she could bring some. It only took a couple of bites into the black and red (the only flavors worth mentioning, in my opinion) and I was transported to those days at uni. I love the density of them. The hearty chewiness of them (not weak and loose in bite like some excessively jubbly candies you can buy). The black currant-y smell of them. They don’t stick to your teeth or make you worry that you’ll loose a filling. They’re just a burst of sweet berry joy and I can’t compare them to anything here in the U.S. Needless to say that packet of wine gums went quickly. My sister-in-law came to visit us this month and also brought a box of wine gums along with Percy Pigs (more on this delicacy in a future post…) and it was again like a tasty reunion of memories and nostalgia, wrapped in animal gelatin and black currant flavors (or lime, lemon or orange, if you prefer the green, yellow or orange, which I don’t touch). Have you tried wine gums? What do you think of them?